Banjo and Ruby Red has been shortlisted for the 2014 Children’s Book Council of Australia’s Early Childhood Book of the Year Award, and rightfully so. It is an emotive story that tugs on the heart strings, created by the dynamic duo, Libby Gleeson and Freya Blackwood, who also collaborated on award-winning Amy and Louis, Half a World Away, and Clancy and Millie and the Very Fine House. This funny and touching story of antagonism and love is by award-winning author Libby Gleeson, with illustrations by internationally acclaimed Freya Blackwood. Banjo is the best chook dog. He works hard and always successfully hustles all the squarking chooks back to roost. All except Ruby Red. She’s more interested in watching the sky, giving the old dog more exertion than he needs. But one day, as Banjo is rounding up the chooks, he discovers that Ruby Red is nowhere to be found and he searches all over the farm. Our hearts drop when we finally find her lying still with her eyes closed. It is through true loyalty, care and compassion that Banjo takes the chicken’s life in his own paws. He lays with her, keeping her warm for days, and we watch as a miracle unfolds before our eyes. It is the finale that captures the most heartwarming, touching moment, so warmly depicted in the beautiful illustrations. Chooks fly into the yard, peck at the ground and settle on their roosts. I love how illustrator, Freya Blackwood has integrated feelings of both still and movement, calm and chaos; from the smooth lines of dozing animals to the sequences and rougher sketching of a leaping Banjo and wildly flying chickens. She has also cleverly used text to add to the impact of the noisy animals, to draw the reader right into the scene. The soft earthy tones of the paint, mixed with the outlines and shadows of black pencil, are perfectly suited to an active chook dog rounding up lively chickens in a farm yard. 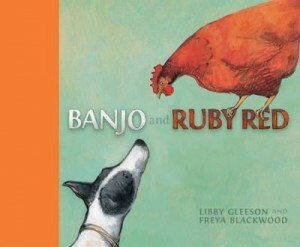 Banjo and Ruby Red is an absolutely gorgeous story about the friendship between a lovable, spirited dog and an obstinate chicken, with a touch of humour, and stunningly captivating illustrations. Definately a book to capture the hearts of readers of any age.